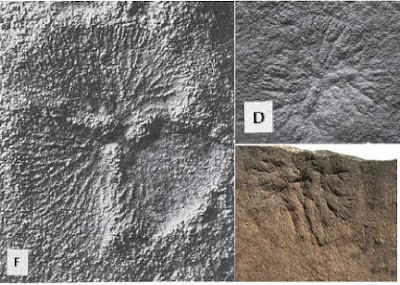 Ediacaran goes back to its roots with this Palaeoporn, with probably the most enigmatic of a group of enigmatics, Tribrachidium heraldicum. Tribrachidium is a disc-shaped organism which is characterised by having three 'arms' which spiral out from the centre. Tribrachidium always occurs in negative hyporelief (pressing up into the bottom surface of the sandstone bed) indicating that it had a rigid body that pressed upwards into the overlying sand. The photo above is actually of a cast taken from a fossil so that the original body relief is shown - i.e. this is positive relief. The actual fossil is at right. The tripartite body plan of Tribrachidium is quite unusual as most metazoans are either bilaterally or radially symmetrical. So what is it? Well Tribrachidium is a cnidarian. Umm no, actually it's a lophophore (related to brachiopods), umm, or it could be an echinoderm, umm, no, it's an ecdysozoan (a group characterised by organisms that shed their external covering), no actually it's a sponge . . . possibly. Alternatively it could belong to a whole new phylum, the Phylum Trilobozoa. Umm, maybe Class Trilobozoa, well, clade trilobozoa anyway. So its been a question of, "Look! Up in the sky! Is it a lophophore? Is it a cnidarian? No it's . . . , umm . . . , it's . . . , well . . . , it's a Trilobozoan! Yeah . . . , that's what it is, a Trilobozoan. [voice from the crowd] It's a what? [voice from the crowd] What's a Trilobozoan? 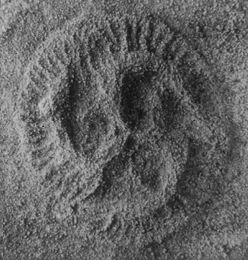 The Trilobozoa are predominately an Ediacaran group who's members have a tripartite or tri-radial body plan, typified by Tribrachidium. The group is a bit of a grab-bag with Albumares and Anfesta from Russia and maybe Rugoconites, as well as some others. The tripartite body plan is almost unique with modern examples confined to teratological (developmental defects) causes. Like Tribrachidium, other trilobozoans are usually found in negative hyporelief and, importantly, although not common, where they do occur in groups they do not overlap, indicating that they are not 'strandings' or simply groups of free swimming forms washed together (otherwise they would overlap). Tribrachidium, the most common and hence most studied, can also be found in size range of 3 to 30 mm indicating a growth pattern of organisms recruited to the sea floor and growing there, rather than a free swimming form where the sizes would be similar due to current activity. Trilobozans are thought, then, to have been sessile filter feeders, attached to the microbial mats, normally by a bulb-like structure, throughout adult life. It appears as though the tripartite body plan, or derivatives of it, were quite common in the Ediacaran. Finds such as Ventogyrus are being reinterpreted as a stalked trilobozoan, but placed within the Phylum Cnidaria. Another form, Eoandromeda octobrachiata, though to be related to comb jellyfish (a group of vicious killer jellyfish), is also though to share a number of features in common with Tribrachidium. So evidence is growing that trilobozoans may well be Cnidarian. Vicious killer jellyfish, trilobed body plans! The Cnidaria have a lot to answer for! It still blows my mind you can look a 400 million year old organism straight in the "face" though still it couldn't be more alien to me... Moar Palaeoporn plzzzz!!!! And what is your favourite explaination? Hmmm... I can see the superficial resemblance to cyclocystoids and edrioasteriods, and I guess the radial symmetry is suggestive of cnindarian rugosid body form, but why lophophore? What is an "interlocking open lattice cover"? See the lines around the outside of the specimen pictured at the start of the piece? In some specimens those lines run right across the specimen and were though to represent an interlocking covering for the animal, but one that is open as the individual elements are not fused together.